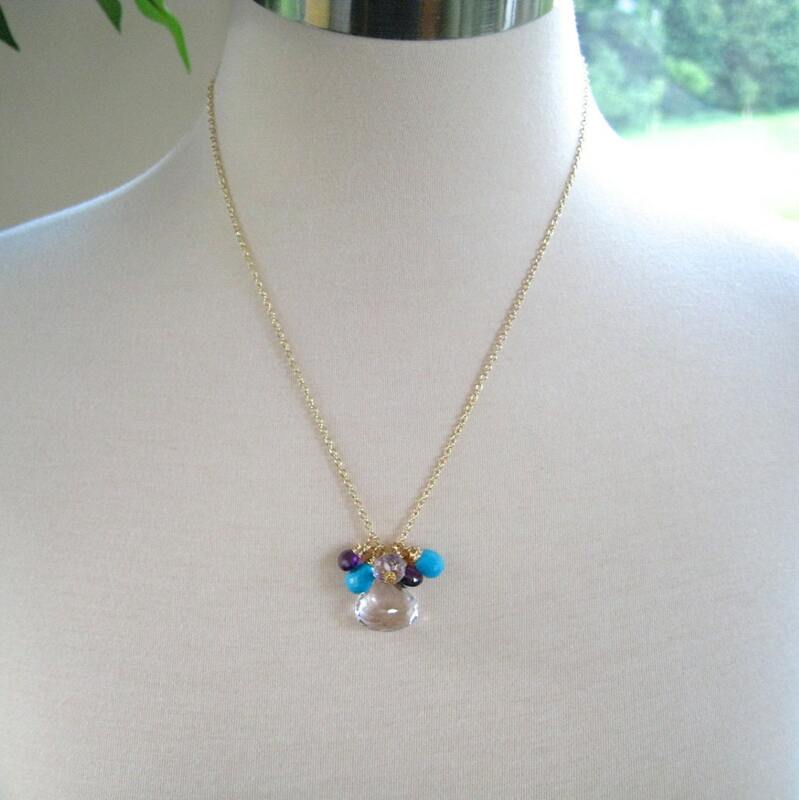 A wonderful collection of gemstone briolettes creates a colorful charm necklace. 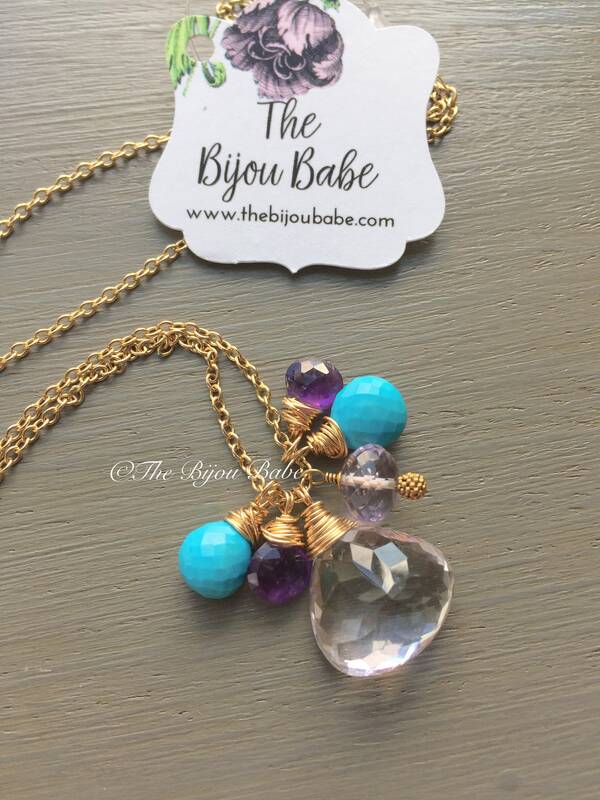 The "Bibelot" features a large pink amethyst briolette, flanked with petite turquoise and deep purple amethyst briolettes. A chubby rondelle of pink amethyst, perched on a fancy beaded headpin is also added to the mix. 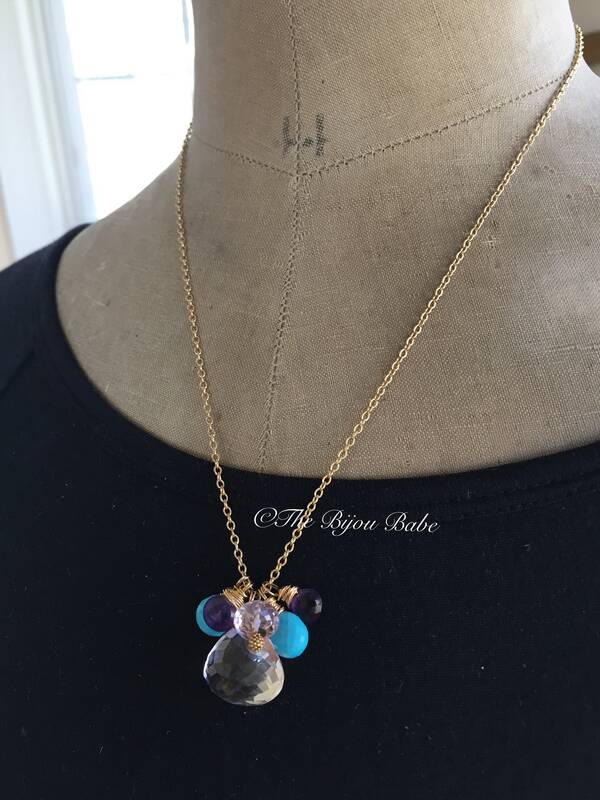 This is a fun and feminine piece of jewelry! Your "Bibelot" necklace will ship USPS first class mail with tracking and insurance in the US, and will be packaged in a lovely gift box tied with ribbon. *What is gold-filled? Gold-filled is constructed in two or three layers. The core metal is jewelers’ brass. Single clad gold-filled has all the gold content in a single layer on one side. Double clad gold-filled splits the gold content into surface layers on both sides of the material. The gold alloy is then bonded to one or both surfaces of the brass core with heat and pressure. The bonded raw material is then sold as sheet or wire to jewelry manufacturers for use in designs. Gold-filled is legally required to contain 5% or 1/20 gold by weight. This 5% is then described by the karatage of the gold alloy. Most gold-filled is 12kt or 14kt gold-filled, all of my designs listed as gold filled are 14kt gold filled.